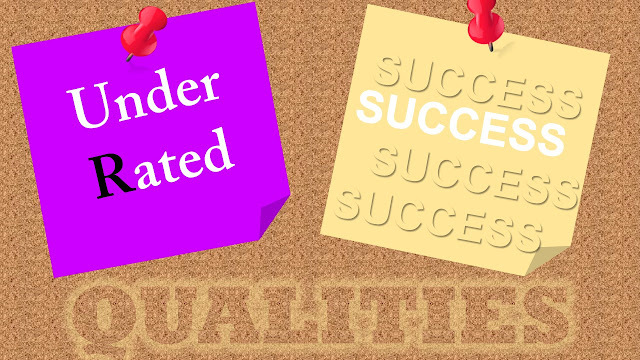 6 Underrated Qualities of Successful People - Motivate Amaze Be GREAT: The Motivation and Inspiration for Self-Improvement you need! Success is one of the major topics that gathers interest in today's world. When it comes to success in life there are many qualities one most possess in order to achieve it. People love to see success, they want success, but most of them don't really know what it takes to get to that point. In order to be successful, there are qualities one most possess. Some of those qualities are pointed out by most authors, and they really form the core principles of success. But by studying some of the most famous people, we got to the conclusion that, there are underrated qualities. People make mistakes, who doesn't? But who makes the best out of those mistakes? First, be unafraid to try, either you get it right or wrong, but it's better to get something you can move on, that not to make any move at all. Second, the ability to learn from a mistake makes all the difference between those who are successful and those who aren't. Third, it's ok! You made a mistake, we all do, but now...admit that you made one, analyze what went wrong and what you can make better the next time. That's all you need to do, but it's so hard for some people to just admit it...please! No more childish attitudes, success doesn't wait forever for you to grow up. Make the best out of your mistakes, and one day you'll be right for sure. This is known as the trial and error method, and it's used by most of successful people. Nobody wasn't right at first, so neither you will. Move on, grow on the inside. It's all about the point of view. To some the rain is spoiler to their day, to others the rain is a opportunity to make money, think about the people who sell umbrellas for instances?! Get the point? What you think about something doesn't mean it's the only definition out there, it's your point of view! If you perceive something as being negative, maybe because... you're looking at it from a negative angle. There is always a bright side to life, you must search for it, in any given situation. Successful people do this quite often, look at professional athletes, some lose a game and it's devastating for their careers, others use that loss for motivation and work harder to make sure they don't lose next time. Look at relationships, negative people see them as situations where they will be hurt somewhere in time, positive people see them as joy all over. Who gets the best out of it? Of course, positive people because they don't focus on what can go wrong, even if something is wrong they will transform it right. That's the power you also have! You are skillful, you are one of the best in your specific area, but nobody will know it if you don't take a step forward and show your work. You are already good, people know you, but nobody is giving you and opportunity to work, no problem...you create your own work by going the independent route. Do you think Jay-Z got is first deal because people thought he was really good? No, he had to create his own label to get a deal for himself, because every other label was rejecting him. This are two clear examples that if you aren't given an opportunity you have to create one. You do that by showing initiative. Don't wait until you get paid to do something, start to do it now for free. You'll get more skills and people will see that you are a initiator, they know they can count on you to be serious in their business. Ultimately it gives you respect and recognition. So what if your first business didn't work out? So what if you thought it was your passion? You can change it and most of times you really need to change it. Don't get stuck with a plan, if it didn't work in 5 years there is a reason why, and it will not work now either. You must change your plan and go to another one. You must adapt to a constantly changing world, what yesterday worked might not work today. You must have flexibility, keep your core foundation intact, but be flexible to change some of the things you do, for better things to come. Successful people do this all the time, you see an example like Steve Jobs that went from the personal computer to produce a mp3 player like the ipod, because he knew the world had change and he also needed to change the product he was offering. What if he stuck with the PC only? No ipod, no iphone, no ipad, imagine that? Successful people are devoted to their craft. Have no doubt about that. Some are devoted to the extreme degree of perfection. But don't get it wrong. That doesn't mean they only develop the necessary skills to be successful in their profession. Most of them do have hobbies and are always willing to learn something new. Some of those things don't relate whatsoever with their current work. But they do learn them. Because successful people know, that success is not eternal, again, what worked today might not work tomorrow. New skills are the foundation of a new way to succeed. What today doesn't make any sense to learn, might serve you tomorrow like you never expected. For example, learn a new language, just for the sake of developing your brain into new vocabulary. Next thing you know, you start to get familiar with that language, and know a new door opens: You can expand your business internationally or work abroad. You never know how learning a new skill can help you in the future. But it will surely help, so learn it. People are successful because they are really good at what they do. No doubt in our mind about it, but it's just a matter of more know-how? Most of the times the real difference about unsuccessful and successful people it's not about skill but will. It's about the commitment. Successful people are committed to what they do, and that's one point the makes all the difference. When it's time to focus on their job, successful people don't focus, they laser focus. They go really deep, that means no distractions, no social media, no news, no dates, no hanging out, no entertainment, no nothing. Just the work it has to be done. They keep it like this until they're done. If you need to focus, it means you are unfocused some of the time, fine because we all are. But when its time to focus, there is no time to waste, so you might well laser focus, look at things with a major degree of intensity to the point where nothing else, in that moment, matters. Make the best you can with what you have.